The events industry has grown enormously in the past decade. According to recent research conducted by Dr. Joe Goldblatt, CSEP, the spends for special events worldwide is ₹34 crore annually. Event management is a good business to get into in these times. There is a requirement for an event manager in almost every field today like in the hotel industry, tourism, the corporate sector, the fashion industry, BPOs, media, newspaper houses, films and serial production houses etc. 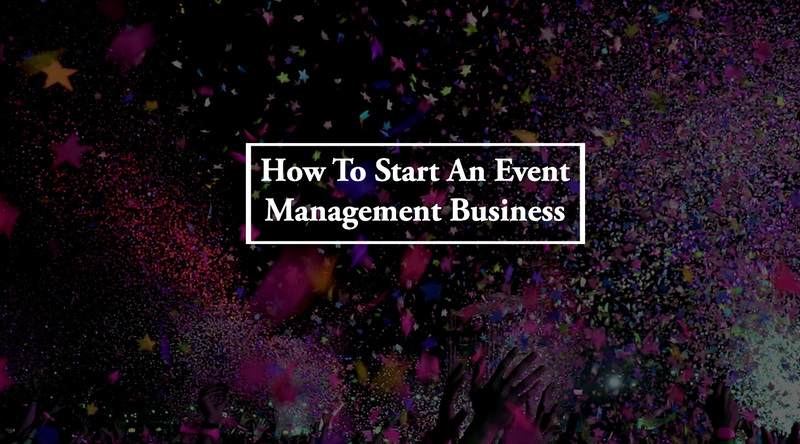 There is also a vast scope for an event manager who wants to set up his own business. If you’re wondering what it takes to start your own business, follow this simple guide and watch your passion come to life. Event planning requires a specific personality: one that’s outgoing, social and creative enough to tackle shifting tasks needed to plan an event. If client-facing work and a fast-paced work life excites you, managing an event management company might be the perfect business for you. Although experience in the event planning is extremely useful it is not necessary. The most important skills for an event planner are organisation, time management, creativity, communication and interpersonal skills. During your career, you will gain some transferable skills. Consider getting a degree, diploma or a certificate from your local university in event planning or management. Many universities provide different courses for event management. There are courses from diploma to degree to post-graduation. Majorly there are three types of event management courses you can take: Diploma in event management (DEM), postgraduate diploma in Event Management (PGDEM) and a post-graduate diploma in Advertising, Media and Event management (PGDAME). To take on the events business seriously you might want to take up a course.Many corporations and members of the general public look for these designations before hiring event planners. Promotional: Product launches, political rallies, fashion shows, fundraisers and galas. The market for social events, especially birthdays and anniversaries, is expected to continue to increase over the next few years. You must create a budget before you start pitching it to your investors. How much money will you need to start your event planning business? That will depend on the cost of living in the area your business serves, whether you work from home or rent office space, what services you will provide as well as if you plan on hiring employees right away or after a while. The budget will allow you to understand how much money you will need for your business. It is also a crucial part of your business plan. With your business plan, you can approach investors and banks to fund your business. This way they will feel more comfortable to give you money. Though a bank loan might feel like a lot of challenges, as long as you have the necessary bank loan documents, it won’t feel as daunting. The funds don’t necessarily have to come from a bank loan either. Since your business will be more specific to your area, you can reach out to friends and family that are willing to invest in your business. Your brand is one of the most important things to figure out since it will be at the forefront of your company image. You must come up with a name for your company. This is the first thing that a customer will remember so make it as interesting as possible. The next thing to do is make sure you have a logo and a tagline. They must align with your brand and be unique. You might want to consult a graphic designer for the logo. Location is critical to the success of your business. It will decide how many people will see and come to your office. You can choose a location that’s on a busy street, near places that are often visited and away from your competition. Another option you have is to start an office in your house. This can help you cut down some costs. You can use an extra room with a separate entrance as an office for consultations with clients. You can focus more funds on your raw material, manpower and equipment. Now that you have a fair idea of your business, it’s time to start marketing your event management business to potential clients, vendors and partners. The best place to start is amongst your own network. Social media plays an important role in marketing these days and makes it easier to get your business out there. This is especially possible with professional networks like LinkedIn. Make sure to be consistent with your social media posts and have a plan in place for what these posts are going to be. Networking events are another way to get in touch with different kinds of people. Be sure to print out business cards with your company’s name and your details as well. You can hand them out at such events for interested clients or partners. So get started on your event management business and if you’re still wondering how to start it, then contact deAsra. We can help you with the complete setup with guidance in different aspects of the business. deAsra aims to provide assistance and support to budding business owners.